Here are three very succinct articles commenting on the significance of FBI Director Comey's Firing. The first is Bill Moyers and Michael Winship questioning whether this represents Trump attempting a coup? What does that mean? He is the Supreme Commander of the land. Who is it he is trying to overthrow? The Constitution? The second is from the NY Times and stresses the obvious - Comey asked for more resources to investigate the Russian connection and promptly was sacked. Finally, Adam Schiff writing in the Washington Post calls for an independent prosecutor. Sorry Donald. Not going away. It is also quite possible that Trump is hiding something quite non extraordinary, such as shady business deals that reach into Russia and involve Jared Kushner.. He is first and foremost a cheap real estate and gambling con man. It is interesting to note that Russia also was involved in the French election. Indeed Putin gave Le Pen money for her campaign and she visited him one month before the election. Putin wants to break up the EU and NATO and electoral interference is one way of trying to pursue his goals. In the Trump case he probably also had financial relationships with Russians. What do we need Portside for if you just stenograph the MSM? this reminds me of america screwing democracy that had been in place 4 decades in a military coup in 1973 .
thanks to america it took 17 years to dethrone the military dictatorship . 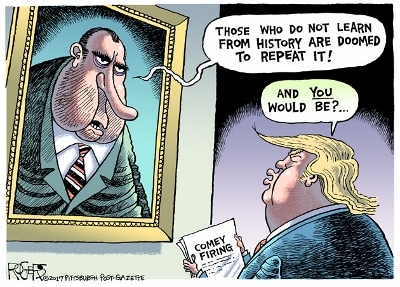 There is no denying the similarities between Trump's controversial firing of FBI director James Comey and Richard Nixon's Saturday Night Massacre during the Watergate investigation. The only difference is Nixon was actually qualified to be president. Dear Progressive Resisters to the Republican/Trump/Pence/Ryan/McConnell et al agenda, check this story below out. These people have been playing the Long Game and have taken over the Federal Government and 2/3rds of our States. The attitudes of the deep South have spread to 2/3rds of our States. Make no mistake! The situation is dire! We must unite to take back the federal and state governments. We can only do this if we educate and organize the electorate to vote progressive in 2018, 2020 and beyond. You might be interested in this, as it may explain a little of Sessions' motives. Myerson rests his principal argument on a single citation - a survey by FiveThirtyEight taken in May during the primaries - that found “'the median household income of a Trump voter so far in the primaries is about $72,000,' or roughly 130 percent of the national median." When I read that in the third paragraph of this lengthy article, I expected he would also support his argument with data on how people actually voted in November. He did not. He assumed, or wants the reader to assume, that the pattern revealed by a single poll in may would be replicated across the country in November. FiveThirtyEight did exit polling in November that was reported by Nate Silver on November 22 that does not support his contention that Trump voters who were "middle class" property owners were more likely than working class voters (who Myerson defines as “in and adjacent to poverty” - a questionable definition, to be sure) to support Trump. Silver argues (and his data support) that educational attainment, not income was a stronger determinant of Trump or Clinton voters. What would be a more sound basis for his assertion could be determined by a cross reference of voter preference to income by census tract. I did not research whether some scholar as done that kind of analysis, but then it appears neither did Myerson - or if he did, he chose not to cite it. Since he is the author, the burden for establishing hard evidence for his thesis belongs to him. Relying on a single pre-election data point for such an important argument is not much different than a climate denier who rests his case on a single winter with below average temperatures. In both cases, any good scientist would point out that is not a sound foundation for either assertion. They are all crooked and TRAITORS! Morning Joe says the WH is polarized now, Trump and Kushner versus everyone. Wow, was that also Betsy's first time in a school? She has no place there anyways. She should be giving the commencement speech for trump university...ohhh, right. She can't. What were those school administrators thinking. Oh, I forget follow the money. Lalo Alcaraz -- award-winning editorial cartoonist and Latino journalist -- captures the essence of the country’s changing cultural and political landscape. 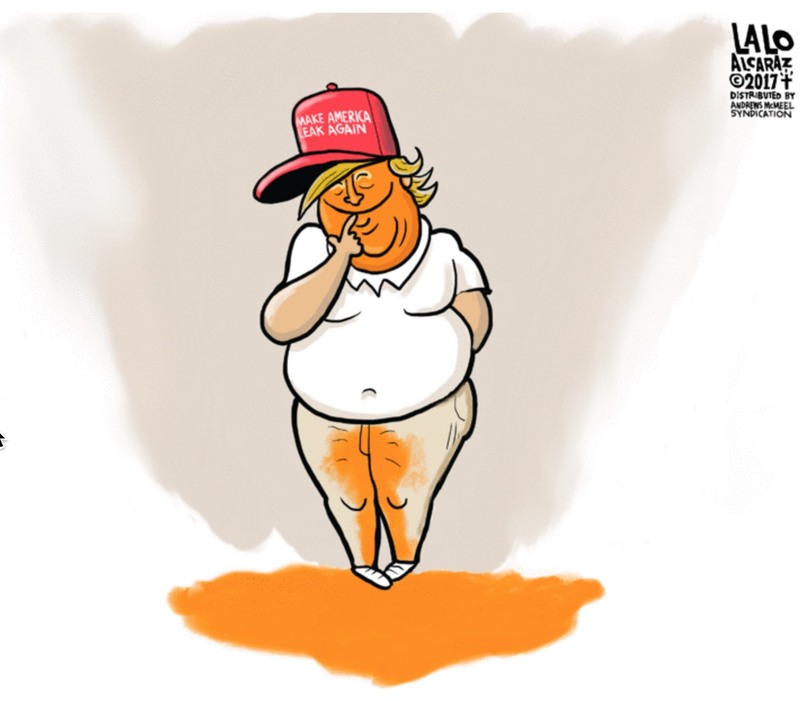 Alcaraz has produced editorial cartoons for LA Weekly since 1992 and also creates cartoons in Spanish for La Opinion, the United States’ oldest Spanish-language newspaper. 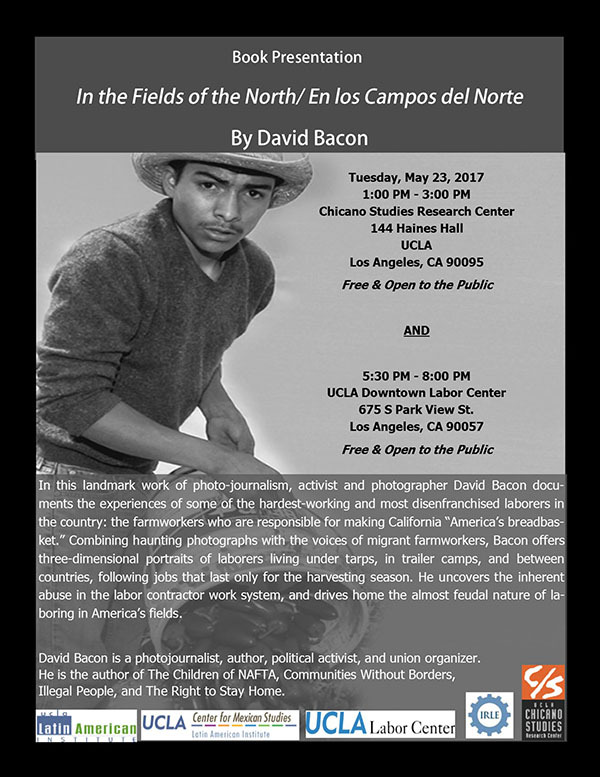 His work has appeared in The New York Times, The Village Voice, Los Angeles Times, Variety, Hispanic Magazine, Latina magazine, La Jornada in Mexico City, BUNTE, (Germany’s People magazine) and many other publications. Add instant variety to your Web site’s news and opinion offerings with Alcaraz’s intelligent, youthful and thought-provoking perspective. for-profit prisons will inspire more of this. This is just one of the many ways, the justice system oppresses the low income poor. Approximately 450,000 people, innocent until proven guilty, are doing jail time in the USA because they don't have the money to buy their freedom. This is loosely reminiscent of the old "debtors' prison", during the 19th century. Too poor to pay your debt, pay it off by serving jail time. In many ways, it's still happening today. A bit of a long read, but a necessary read if you wish to try and understand our nation and its institutionalized racism! Still have the Make America Great Again baseball caps that were made in China? Dana Frank rakes up every slim, tangential connection between backward political tendencies and “Buy American” campaigns, to create an argument that sounds strong, but ends up being largely nonsensical. First and foremost, every other country on earth that produces industrial goods has purchasing preferences for domestic or regional products. Europe developed Airbus to have a European option for aerospace, both commercial and military. Vast sums of government revenue and private investments are involved in aerospace purchases, and with that comes thousands– hundreds of thousands – of jobs. It is not unreasonable for a country or a region to want investments on that scale to support local employment rather than being spent overseas. Europe, China, Japan all have explicit and implicit spending preferences. These are not based on racial hatred or discriminatory practices. It’s common sense, and a world-wide practice, except where capitalism has the least restraints – here in the USA. Frank complains that Buy American may interfere withAmericans’ consumer choices. That’s the argument of those who state that so-called “free trade” helps US workers’ wages go further by providing an increasing supply of products made more cheaply elsewhere. Meanwhile the wages of all workers decline, and organizing in US manufacturing is continually stunted by threats to workers that their jobs may be the next to go. The US Government buys billions of dollars worth of stuff, all paid for by American taxpayers. These are real, actual manufactured goods that could create jobs here – for the people who help pay for the purchases. Otherwise, as we have already witnessed, government spending becomes a siphon that pumps cash out of this country to create exploitive jobs internationally. Nobody believes in the altruism or loyalty of multinational corporations. But they oppose any laws or regulations that limit the mobility of capital. Trump was smart to campaign on the quiet outrage so many feel about the draining of the American economy. We can agree he is confused at best, and it's likely he is completely insincere. That does not mean favoring domestic purchasing is wrong. We need a real industrial policy that promotes US jobs, encourages production of innovative technologies and penalizes the export of jobs. A real industrial policy would allow us to plan and implement a shift from huge military contracts to non-lethal products that enhance our society and the world’s. No one argues that we can or should produce everything here. Nor will we ever return to the diversity of production we once had. But a “progressive” position that lines up with multinational outsourcing and exploitation, while ignoring US workers’ real need for good jobs, hardly seems progressive at all. While the labor notes interview does a good job exposing the bad nature of most “buy American” campaigns, it, like most of the left in this country does not address the need for an industrial policy for this country. It neglects the basic fact that manufacturing, the production of real goods is the basis for a sound economy. There are anti-working class sentiments in some people who promote ”international solidarity”, i.e. the US working class has had it too good and it’s a good thing that US manufacturing jobs have gone to other countries. I believe that the fight against racist protectionism does not mean that we should not fight to exert control over capital flight and be opposed to US capitalist imperialism. Re: The Census Won’t Collect L.G.B.T. Data. That’s a Problem. Some of this article is false equivalency. Many people cannot GET birth control because their insurance won't cover it. Why? Because they are working for some "religious" organization or CEO head, such as Hobby Lobby, etc. Other women are forced to bear children due to lack of health care options.Many have had to risk their lives because the only hospital close to them was a religious hospital that would not take care of them in the medically sound manner. And some women in the US, yes the US, have been put in jail due to a miscarriage that was construed as murder. I think we are closer to the Handmaids Tale than this author cares to admit. Sounds like the author wants the government do everything for them. In a word, socialism. I will quietly disagree with that position. I have been thinking about this for weeks and wondering where to get it. This was right-on target when it first came out during the McCarthy period; was again on-target when re-broadcast during the time of Watergate and the impeachment of Nixon, twenty years after first being broadcast. Now 45 years later, it is again right-on target during the time and crime of Trump. I remember hearing this in the car when it was first broadcast, not because I got it, but because of my parents' reaction. I bought the recording at some point in the 70s and still have it. In the late fifties, as an MIT student, when passing through many of the stations mentioned, I was often reminded of A. J. Deutsch's wonderful SF short story "A Subway Named Moebius". Since the date of this fantasy was 1950, the thought has often occurred to me that Deutsch might have been inspired by the "MTA Song", created for the 1949 Boston mayoral campaign of Walter O'Brien. As in "Moebius", it involved someone trapped on the subway - by economics (lack of a nickel), not by mathematics! A good write-up on a grand song. While I appreciated the attempt at even-handedness of the NACLA article on Venezuela, I question its assumption that a democratically elected leader cannot be authoritarian: "The idea that Venezuela is authoritarian has been repeated ad nauseam for nearly the entire eighteen-year period of Chavista rule...Until recently, it has been relatively easy to refute this claim, which ignores the fact that Venezuela’s ruling party has been repeatedly affirmed at the polls...." A partial list of democratically elected authoritarian leaders would include Hitler, Erdogan, and Donald Trump. Thanks for this clear and convincing analysis from NACLA. Sadly Telsur and other apologists for the Maduro regime are still promoting the regime's alternative reality propaganda rather than providing the sort of reality based reporting that we got from NACLA. Yale continues to evade its legal responsibility to bargain with the legally certified union representing graduate teachers at Yale. Since April 25, the fast by graduate teachers and their occupation at Beinecke Plaza has continued as well. Despite calls from 12, 000 members of the Yale and New Haven community, including over 100 faculty of Yale and Yale Law School, the Yale administration is cynically and opportunistically stalling, waiting for Trump to reappoint the NLRB. We are now asking everyone to sign the following Solidarity Statement urging the Yale Administration to negotiate with the union. Please follow this link to sign on. Young people deserve a bright hopeful future. We stand together with the courageous young scholars at Yale University who have chosen to fight for their future. The cause for which the graduate teachers are fighting does not belong to them alone. A secure living, fair benefits, a workplace free from racism and sexual harassment, and a voice in their conditions—these are the rights of all working people. We applaud their steadfast commitment to justice in the wake of their administration’s refusal to engage in constructive dialogue. We honor their spirit of unity, a powerful contrast to the spirit of Trump and his efforts to divide. We call on the Yale Corporation and Yale President Peter Salovey to immediately stop their tactics of delay, to begin a constructive dialogue in keeping with the spirit of the University, to embrace the values of these young scholars and to celebrate their efforts to create a more equitable and democratic society. Their cause is our cause. Their future is our future. Great meeting of the Portside moderators collective. We do it every year - proud to be in that number. (All the mods who couldn't make it - you were missed!) If you don't subscribe to our email list, Portside.org - get with it! It's free. Are you—or is someone you know—interested in applying for our summer-long volunteer leadership program? Trumpcare's passage last week was bad enough. Donald Trump's obstruction of justice by firing FBI Director James Comey takes the threat facing our country to a whole new level. By taking an unprecedented action to block investigations that could threaten his grip on power, Trump has led us into nothing short of a constitutional crisis. We are fighting back, and planning for a summer of resistance. If you are outraged by Trump's obstruction of justice in firing Comey, by his assaults on immigrants and Muslims, by Republicans voting to take away our health care, and by the rest of this administration’s attacks on our communities, and if you’re ready to take your resistance to the next level, Resistance Summer is for you. As part of this program, we’re looking for 1,000 MoveOn Mobilizers to start organizing their communities, building relationships, turning up the heat on their elected officials, talking with and registering voters, and laying the groundwork for an unprecedented progressive tsunami next year. By entering our summer-long volunteer leadership program, Mobilizers will be teamed up with cohorts led by expert Resistance Facilitators, participate in weekly online trainings, put their skills into practice by organizing monthly events in their community, and receive a $150 monthly reimbursement to help cover the hidden costs of volunteering. 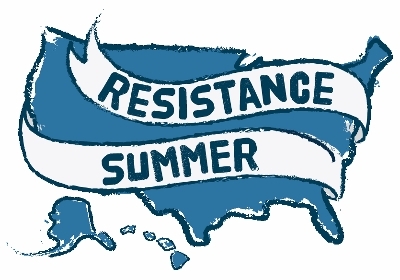 Know someone who should apply to be a Resistance Summer Mobilizer? Maybe you? Check out the Mobilizer role description here, and submit your application. The deadline to apply for the program is Sunday, May 21. It’s been a truly terrible 100+ days since Trump took office. But in the face of some of the greatest political challenges of our lifetime, we, the people—many of us new to political action—have risen up and have not wavered. Collectively, our broad movement has halted Trump’s Muslim Ban, blocked much of his devastating budget proposal, strengthened our networks and resolve to protect our communities, and filled the streets in record-smashing numbers. We know the Resistance is a marathon, not a sprint. And we’re going to face many challenges this year and moving forward—from a president who encourages white supremacists and bigots, to the deliberate undermining of our democratic institutions, to climate chaos and denial. The only way to sustain our movement and continue to win the victories we need is to organize and mobilize. That’s why we’re launching Resistance Summer—and recruiting 1,000 people across the country to receive training, support, and coaching as the first class of MoveOn Mobilizers. 3. win tangible victories this summer against Trump's agenda through both defensive and proactive campaigns.? First step: We’re looking for 1,000 fierce, resolute MoveOn Mobilizers for Resistance Summer, who can volunteer 5–10 hours per week over the summer to organize high impact efforts in their community. … are willing to do the hard work of recruiting, training, and organizing others via media events, voter contact, and direct action. Read more, and apply right now to be a MoveOn Mobilizer. As a Mobilizer, you’ll volunteer 5–10 hours per week over the summer, organizing one event each month in your local community. You’ll work closely with a small cohort of other Mobilizers matched from communities facing similar challenges and opportunities, have an experienced movement leader working with you all summer to help you learn and grow as an organizer, participate in weekly trainings, and upon completion of the 12-week program, have an opportunity to join MoveOn’s national rapid-response network to help your community respond to critical national moments. You don’t have to have any previous experience in politics or community organizing—though if you do, this is still an opportunity to take your capacity to the next level. You do need to have the fire in your belly to fight this Trump administration every step of the way. Together, we’re going to keep our democracy intact and our communities strong—and pave the way for a better future. Can hardly believe it’s finally happening. Chelsea Manning was released from prison yesterday, after 7 years of incarceration. Chelsea has been through so much, including months in solitary confinement and being held in conditions that the United Nations considers to be torture. Her release is a huge victory for democracy and human rights, but she still needs our support. Chelsea’s attorney has launched a GoFundMe campaign to make sure that her basic survival needs are met in the coming year as she transitions back into society. Will you chip in to support her? Thousands of people have already donated to make sure that Chelsea has food to eat, clothes to wear, and a roof over her head as she re-enters the free world. But with just days to go before her release, the campaign is still $30,000 from it’s goal to cover Chelsea’s basic needs. Can you help us get there? If you can’t contribute, that’s okay! Please share the link with your friends and family and spread the word. All of the money will go directly to Chelsea through a bank account set up by her sister -- Fight for the Future is not taking any of it. As someone who has gotten to know Chelsea speaking to her on the phone regularly over the past few years, I can tell you that she is one of the bravest and most compassionate people I know. Thank you so much for supporting her and speaking out. Together we have changed Chelsea’s life, and changed the world. The Jackson Street Workers Mural Project began in 2014. The Washington State Labor Council, AFL-CIO was about to move into our new Seattle office at 16th & Jackson, where the city’s historic African American Central and International Districts converge. The mural would be a gift to our neighbors; telling labor history through the lens of communities that are frequently marginalized and ignored. Painting of the mural panels began in Spring 2016 in the artists’ studio in the Inscape building, the former Immigration and Naturalization building that’s been repurposed. It’s an appropriate setting. 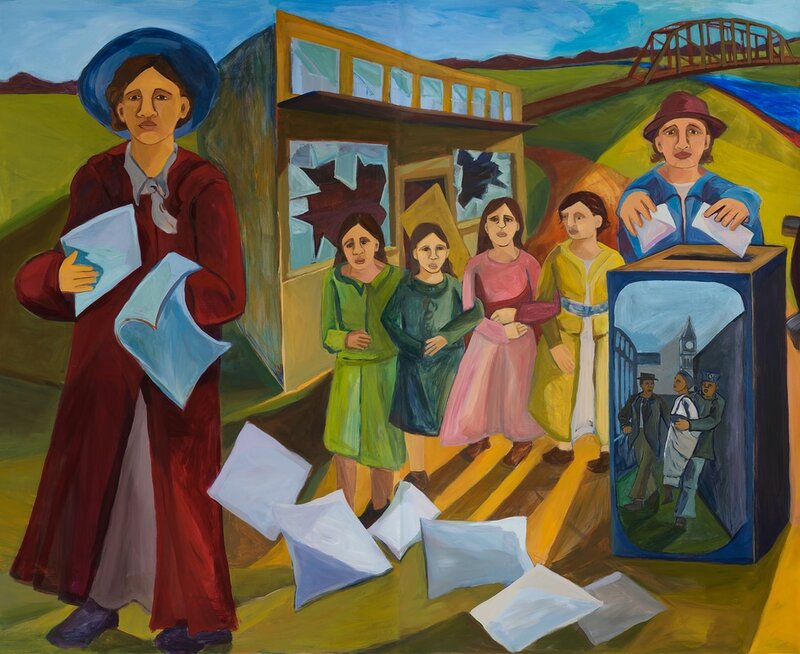 The mural depicts labor history through the stories of the working women and men in Washington. It focuses on stories that are frequently not told but inform the persistent struggle for economic, racial, and social justice that is labor’s legacy in our state. The mural shows how our history is informed through struggle, movement building, and solidarity. So much is covered—from the free speech fights, to Seattle’s general strike, to the World Trade Organization march; from migrant organizing, to Rosie the Riveter, to Black Lives Matter. The project shows pride, solidarity, and hope—and it also tells the truth. 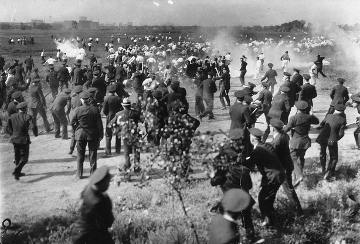 We see the Chinese expulsion, the detainment of Japanese, the Everett and Centralia Massacres, the segregation and desegregation of organized labor. We learn from the triumphs, and the errors of the past. Throughout the mural, during hard times and good times, we see the resilience of workers and the continuing fight for a better world. The mural tells our history, and the final section depicts our hopes and aspirations for the future. The painting tells the story, but it will be supplemented by street-level QSR codes linking to a website with more information on the history, and the unions involved. The mural was completed with a block party celebrating its unveiling on April 30th. The Jackson Street Mural Project received grants from Seattle’s Department of Neighborhoods and King County’s 4 Culture. 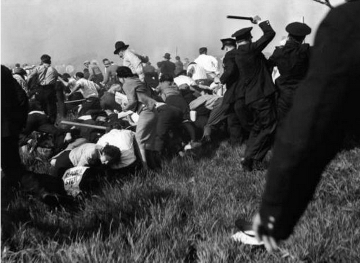 Memorial Day 1937, ten steelworkers and supporters were shot and killed while peacefully demonstrating at Republic Steel for the right to form a union. Again, today, workers are standing up and fighting back against hostile anti-labor politicians. 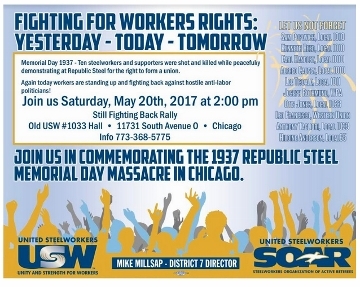 Join us in commemorating the 1937 Republic Steel Memorial Day Massacre in Chicago. Book tour by Helena Sheehan, author of the important new book The Syriza Wave: Surging and Crashing with the Greek Left. We hope you can join us for one or more of these events for a discussion of the implications of the Syriza experience for the left in Europe, the United States, and beyond. Thursday, May 25, 6:30pm, New York City, New York University, King Juan Carlos I of Spain Center at NYU, 53 Washington Square South, Manhattan. Sheehan will be joined by Nantina Vgontzas, Ph.D. Candidate in Sociology, NYU; Member, GSOC-UAW 2110 and AKNY-Greece Solidarity Movement. Welcome: Molly Nolan, Professor of History, NYU, and Brooklyn for Peace; Chair: Thomas Harrison, Co-Director, Campaign for Peace and Democracy. Sponsored by the NYU Department of History, co-sponsored by Campaign for Peace and Democracy, AKNY-Greece Solidarity Movement, Monthly Review Press, and The Marxist Education Project. Tuesday, May 30, 2pm, Philadelphia, Drexel University (Room 114 PSA building, 3240 Powelton Avenue). Sponsored by Drexel's Department of Anthropology, Graduate Program in Communication, Culture and Media, and the Drexel Socialists Club. Tuesday, May 30, 7pm, Philadelphia, Wooden Shoe bookstore, 704 South Street. Sponsored by the Philly Socialists and additional organizations t/b/d. Wednesday, May 31, 6:30pm, Washington D.C., Busboys & Poets, 2021 14th St NW. Introduction by Medea Benjamin, Co-Founder of CODEPINK and author of Kingdom of the Unjust: Behind the US-Saudi Connection. Co-sponsored by Busboys and Poets, CODEPINK, Campaign for Peace and Democracy, Jacobin and Metro DC DSA. 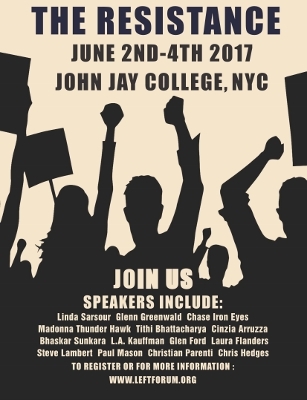 Weekend of June 2-4-Left Forum, NYC, John Jay College, 899 Tenth Avenue, Manhattan.Two panels, date and time to be announced. Panel #1: What Next for the European Left: Confronting the Challenge of Right Wing "Populism," Helena Sheehan, Kevin Anderson, who teaches Sociology, Political Science, and Feminist Studies at the University of California, Santa Barbara, and is a member of the International Marxist-Humanist Organization, and Catarina Principe, member of Bloco de Esquerda (Portugal) and a contributing editor at Jacobin. Co-sponsored by Campaign for Peace and Democracy, New Politics, and International Marxist-Humanist Organization. Panel #2: The Syriza Wave: Surging and Crashing with the Greek Left with author Helena Sheehan plus Despina Lalaki, Adj. Assistant Professor, Sociology, Baruch College, CUNY; Member, AKNY-Greece Solidarity Movement, and Aaron Amaral, labor lawyer and member of the International Socialist Organization and AKNY-Greece Solidarity Movement. Co-sponsored by Campaign for Peace and Democracy, AKNY-Greece Solidarity Movement, and New Politics. A seasoned activist and participant-observer, Helena Sheehan adroitly places us at the center of the whirlwind beginnings of Syriza, its jubilant victory at the polls, and finally at Syriza’s surrender to the very austerity measures it once vowed to annihilate. Along the way, she takes time to meet many Greeks in tavernas, on the street, and in government offices, engage in debates, and compare Greece to her own economically blighted country, Ireland. Beginning as a strong Syriza supporter, Sheehan sees Syriza transformed from a horizon of hope to a vortex of despair. But out of the dust of defeat, she draws questions radiating optimism. Just how did what was possibly the most intelligent, effective instrument of the Greek left self-destruct? And what are the consequences for the Greek people, for the international left, for all of us driven to work for a better world? The Syriza Wave is a page-turning blend of political reportage, personal reflection, and astute analysis. Helena Sheehan is Professor Emerita at Dublin City University, where she taught history of ideas and media studies. She is also the author of several books, including Marxism and the Philosophy of Science: A Critical History and Irish Television Drama: A Society and Its Stories. Over the years, she became increasingly committed to a form of writing that is both experiential and intellectual. 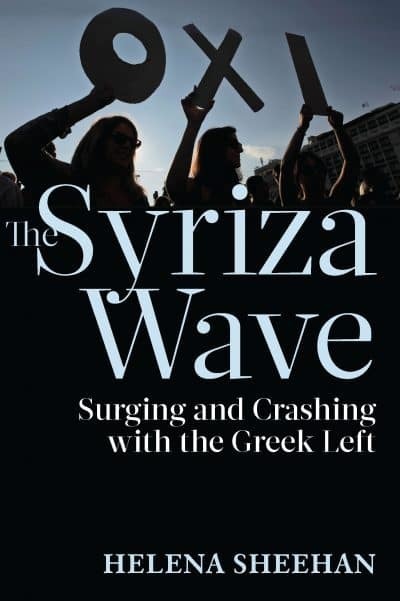 Her latest book The Syriza Wave: Surging and Crashing with the Greek Left combines elements of theory and travelogue. A philosopher, historian and political activist, Helena Sheehan grew up in cold war America and the pre-Vatican II Catholic Church. She became a nun after graduating from high school. Sheehan increasingly questioned everything she had been taught. She left the convent and the church and became active in the US New Left in the 1960s, both on campuses and on the streets. Sheehan moved to Europe in 1972. Although based in Ireland, Sheehan moved around Europe, east and west, and was active at various times in social democratic and communist parties and many broad social movements. She earned her living doing different jobs, but primarily as an academic, eventually as a university professor. She has published in the areas of history of ideas, science studies, media studies and politics. The Syriza Wave can be ordered from the publisher, Monthly Review Press, here. We are excited to announce 3 outstanding additions to our opening plenary! Puerto Rican community activist Oscar López Rivera has been widely recognized as the “Mandela of the Americas” since several Latin American heads of state bestowed that title upon him at the 2015 Organization of American States summit. At age 74 and after more than thirty-five years behind bars, upon release on May 17, 2017, Lopez Rivera had the distinction of being the longest-held political prisoner in the history of Puerto Rican-US colonial relations. Born in San Sebastian, Puerto Rico in 1943, López Rivera moved to the US with his family at age 14. As a young adult, he was drafted into the US military and sent to fight in the front lines of Vietnam, where was awarded the Bronze Star for heroic service. Politicized by his experiences in Vietnam and the active social change movements he encountered upon his return home to Chicago in 1967, Lopez Rivera became involved with many community empowerment groups—eventually helping to found the award-winning alternative Dr. Pedro Albizu Campos High School. Along with his brother Jose, López Rivera also helped found Chicago’s Puerto Rican Cultural Center. Aware of the developing revolutionary processes in Puerto Rico and throughout the world, he eventually decided to join the clandestine movement. Arrested in 1981, López Rivera (and his colleagues arrested in 1980 and 1983) declared themselves to be anti-colonial combatants entitled to the protection of international law, challenging the jurisdiction of the U.S. courts to criminalize their efforts against colonialism, a crime against humanity. Once imprisoned, López Rivera faced years of torture which he has termed “spiriticide,” including sensory deprivation, more than twelve years of solitary confinement, and subjugation to the super-maximum security practices of the prisons-within- a-prison at Marion and ADX Florence. López Rivera nevertheless became a prolific writer and a proficient artist, painting portraits and tributes to his native homeland. López Rivera has authored countless articles which have inspired many generations; in the last years before release, he helped produce two books of writings, Between Torture and Resistance (PM Press, 2013), and Cartas a Karina (CAK Project, 2016). A transcendent figure in contemporary Puerto Rican life, Oscar Lopez Rivera’s plan for life after prison is to develop the Fundación Oscar López Rivera- Libertá, which will deepen the unity and work for decolonization which has been the cornerstone of his entire life. Sekou Odinga is a Muslim, citizen of the Republic of New Afrika, former member of the Black Panther Party/Black Liberation Army (BPP/BLA), and for 33 years a u.s. held Political Prisoner of War. Sekou helped establish and was a leader of the Party’s Harlem/Bronx chapter before being targeted by the FBI’s COINTELPRO program. He escaped arrest and trial as one of those targeted in the 1968 New York Panther 21 case. Forced underground, Sekou was sent to Algiers to help establish the Party’s international section. In the mid-1970s, he returned to the states and continued to struggle underground until his capture on October 23, 1981. Convicted in both state and federal court, Sekou served twenty-eight years in federal prison on two counts of the federal Racketeering Influence Conspiracy Organization ACT (RICO) and the liberation of Assata Shakur. In 2009, he reached a mandatory release date and was "paroled" to New York State to begin serving a 25 to life sentence for the attempted murder of six NYPD. Five years later, a legal victory resulted in a parole hearing and his November 25, 2014 release from Clinton Correctional Facility. Sekou continues to work on behalf of and advocates for the release of more than a dozen u.s. held Political Prisoners of War from the revolutionary movements of the 1960s and ‘70s. He is a founder and member of the Northeast Political Prisoner Coalition, and has spoken on panels, at conferences, and on university and college campuses across the country. He has been featured in and contributed to numerous anthologies, including the forthcoming Look for Me in the Whirlwind: From the Panther 21 to 21st Century Revolutions (PM Press, 2017), and has been interviewed extensively in print and radio. Sekou is available for public speaking on various topics, including political/mass imprisonment, the Black Liberation struggle, and more. Molly Crapapple is an artist and writer living in New York. Her memoir Drawing Blood was published by HarperCollins in December 2015. Her work has been described as “God’s own circus posters,” by Rolling Stone, but beneath the lavishly detailed surface, it engages injustice and rebellion. Because of Molly’s 2013 solo exhibition, Shell Game, a series of large-scale paintings about the revolutions of 2011, she was called “an emblem of the way that art could break out of the gilded gallery” by The New Republic. In 2015, Molly Crabapple was awarded Yale Poynter Fellowship, and received a Front Page Award for her art of rebel-held Aleppo. Her art also earned her a 2014 Gold Rush award, and she was shortlisted for a 2013 Frontline Print Journalism Award for her internationally-acclaimed reportage on Guantanamo Bay. Molly is a contributing editor for VICE and has written for The New York Times, The Paris Review, Vanity Fair, The Guardian, CNN and Newsweek. Her published books include Discordia (with Laurie Penny; Random House, 2012) on the Greek economic crisis and the art books Devil in the Details and Week in Hell (IDW 2012). Molly has been called “equal parts Hieronymus Bosch, William S. Burroughs and Cirque du Soleil,” by The Guardian; “THE artist of our time” by comedian Margaret Cho, and “a brilliant and principled artist” by BoingBoing. She spent four years as the staff artist of The Box, one of the world’s most lavish (and notorious) nightclubs. Molly has taken her sketchbook from burlesque halls to refugee camps, always with a skeptical eye for power. Molly is the illustrator of Matt Taibbi’s New York Times bestseller, The Divide. She has collaborated with Spike Jonze to create backdrops for the 2013 YouTube Music Video Awards, and with Esperanza Spalding on projections for her concerts. She created art for Patton Oswalt’s DVD, Tragedy Plus Comedy Equals Time. She regularly speaks to audiences around the world, at institutions such as The Museum of Modern Art, The London School of Economics, and Harvard and Columbia Universities. Her works are held in the permanent collections of the Museum of Modern Art, The Barjeel Foundation and The New York Historical Society.